Ted Cruz, short on intellect but long on hatred, seeks to pocket as much money as possible from a failed run for the presidential nomination of the USA’s Taliban Party. But a new computerized breakthrough may be his noisy undoing. It’s usually instructive and always entertaining to speak with Skunkbreath and Wetpalms, the two GOP operatives who make their living performing dirty tricks for whichever scummy Republican candidate stoops to hire them. This week our topic of discussion was Tailgunner Joe, the notorious demagogue Joseph McCarthy. Publisher’s Note: this series of political articles running up to the 2016 political election are intentional satire, by author John Scott G, and not based on actual fact (aside from some of the stupider things, which are sadly factual). Oops, wait a second. 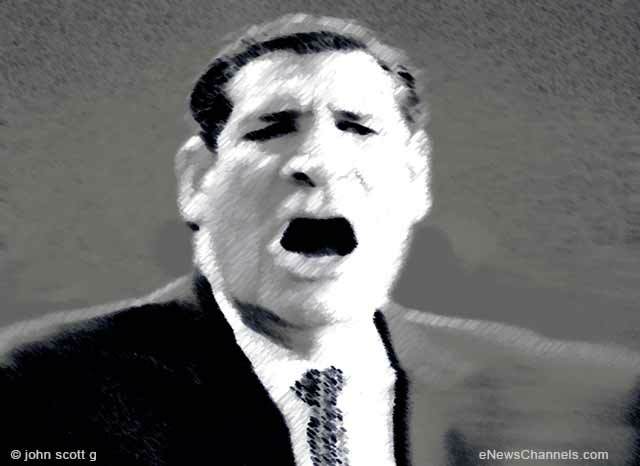 My mistake, I meant Fire Crier Teddy, the notorious demagogue Ted Cruz. You can understand my error — they resemble each other physically and spiritually, plus they have the same laissez-faire approach to things like facts, truth, justice, fairness, and decency. “Yeah, Teddy-boy is a bit of a throwback to when Red-baiting was a successful stunt for troglodyte candidates,” Skunkbreath said. “So you think he’ll be caught?” I asked. “Well, the press will document his gopisms but it won’t matter much,” said Wetpalms. I ignored him and went back to my prepared list of questions: “Do you think someone like Ted Cruz can win the TeaPublican nomination?” I asked. “Nope,” the other one said. “Too radical for Republicans?” I asked. “You mean because he wants to destroy the basic tenets of America?” I asked. “But don’t all Republicans want that?” I inquired, knowing the answer. “But if he can’t win, what’s the point of his campaign?” I asked. “It’s like with Mike Huckabee, Ben Carson, Herman Cain, Sarah Palin, and all the fringe candidates,” Wetpalms pointed out. “Or they can really go the Huckabee route and tout bogus mail-order products,” Wetpalms said. “Isn’t there anything that can be done to stop them?” I asked. They glanced nervously at each other. Finally, Wetpalms broke the silence. “Yeah, keep quiet,” Skunkbreath told him. They eyed each other again. The tension in the room was becoming oppressive. “Oh for crying out loud, what is it?” I said. “What? Is that possible?” I asked. “You have a printout from the computer?” I said in amazement. “The computer types in all caps?” I asked. “This thing is terrific,” I said. “Anyway, this CORTEX thing is great,” I noted. “That sounds bizarre,” I said. “Yeah, well, it’s a brave new world that’s coming. And it’ll mean the end of Faux News,” Wetpalms said. This opinion piece is Copr. © 2015 by John Scott G and originally published on eNewsChannels.com – a publication of Neotrope® – all commercial and reprint rights reserved. Illustrations by and © JSG. Opinions expressed are solely those of the author.